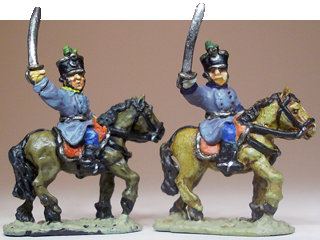 As part of the two Hungarian three-battalion regiments I needed to paint, only two Hungarian mounted infantry officers were on my painting to-do list. 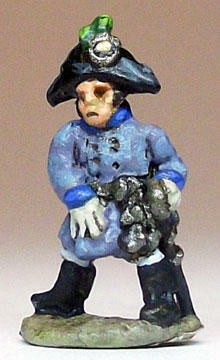 Like the figure, many of the other Pendraken Austrian command figures sport an unfashionable ‘queue’. As the Austrian army’s use of the queue was officially abolished in 1805 this, presumably, is to allow the pre-1809 collector to buy into the Austrian range. For an 1809 army, they really should be snipped off to bring the figures fashionably up to date – as I did with one of the mounted officers. The figure on the left was undercoated with Montana Gold Dark Brown (SHOCK 8020), the figure on the right with Montana’s Duck Season (G8040) – see Post 27. 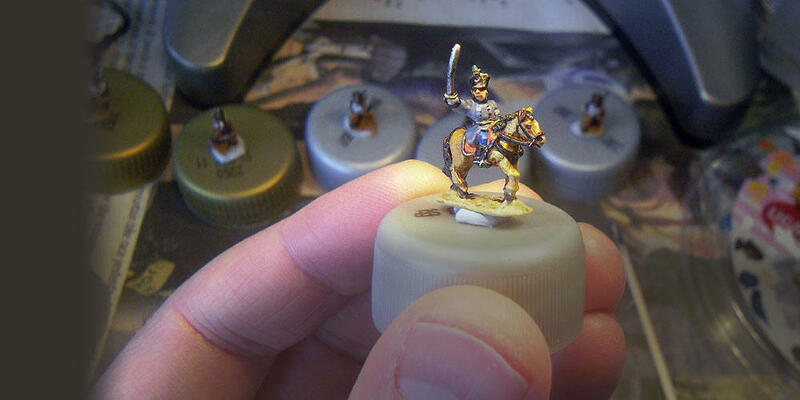 I used these colours as the base of the horse colours. It’s a matter of choice whether or not to paint the cuffs of the officers’ greatcoats with the regimental facing colour – although most examples I’d seen of Napoleonic Austrian officers in greatcoats had plain uncoloured cuffs. This, however, didn’t stop me painting most of mine pretty colours. My converted Austrian artillery officer (see Post 44) was painted as an infantry or staff officer with Bavarian sky blue facings. 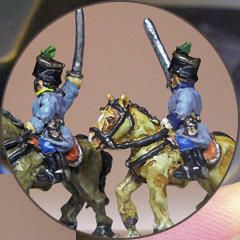 The sky blue facings made him the first of a new regiment – a regiment way down the painting queue. It was sure to be a while till his unit caught up with him.